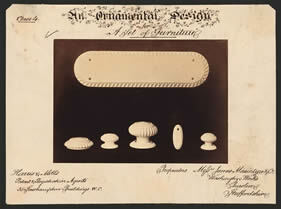 An ornamental Design for a set of [door] furniture. Harris & Mills, Patent & Registration Agents, 35 Southampton Buildings WC. Proprietors Messrs. James Macintyre & Co, Washington Works, Burslem, Staffordshire.